Meghalaya carries a bewitching world in its belly. The natural caves found in Jaintia Hills are a storehouse of geological treasures. Rivers and streams flow through some of their dark, damp chambers, lending an other-worldly beauty to the caves. The rocky roof hangs so low at times that the explorer has to crawl on all fours. And to explore there is a lot: various life forms and geomorphological features carrying records of climate change in a different era. These treasures may just be lost before they are fully appreciated because rampant coal mining is systematically destroying these caves. Jaintia Hills is also a major coal producing area, with an estimated 40 million tonnes of coal reserve. The state government, which had promised to formulate a comprehensive policy to regulate private coal mining and limestone quarries over one-and-a-half years ago, is yet to deliver. Prompted by a public-interest petition, filed in the Supreme Court by a group involved in mapping caves, the government set up an expert committee in August, 2006, to look into unregulated mining activity in the state. Nothing much has happened since. The government has a ready excuse. "There are many members in the committee, and many are from other states like Delhi and Jharkhand. It takes time to receive all the recommendations from all the members and frame the final policy. The draft mining policy is ready and will be out soon," says Arindom Som, the state mining secretary. While the government still has no idea how it is going to control it, indiscriminate mining has begun to threaten the famed Krem Liat Prah-Um Lm-Labit cave system in Jaintia Hills, the longest in India at 30.9 km. Jaintia Hills is part of the Meghalaya plateau made of rocks belonging to the Archean (2.5-4 billion years ago) and Tertiary periods (63 million to 2 million years ago). Meghalaya has the largest concentration of caves in the subcontinent. About a thousand caves were discovered in the past decade and most of these are yet to be explored and mapped. Over the years, 118 cave passages, stretching across 148 km, have been mapped on the Nongklieh-Shnongrim ridge, 60 km from Jowai town in Jaintia Hills. The ridge has India's longest Krem Liat Prah and third longest Krem Umthloo cave passages. Cave sediments and stalagmites--conical limestone pillars rising from the floor--represent an undisturbed chronological repository of records of climate change which can stretch back to one million years. 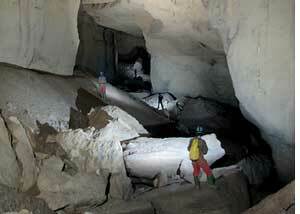 "Caves hold the key to understanding world climate changes. Taken in their totality the caves of Meghalaya should be considered national and archaeological heritage sites that call for concerted protection at both the national and state levels," says Brian Daly Kharpran, secretary, Meghalaya Adventure Association, which had filed the petition seeking a ban on mining to save the caves. "Only Meghalaya has high quality caves in the country, therefore, there is an urgent need for the government to have a new approach to coal extraction," adds Terence M Whitaker, a biologist and an authority on caves. Besides being geologically important, these caves are rich in biodiversity, teeming with fish, salamanders, spiders, woodlice and millipedes, which have adapted to the cave environment--they have no eyes, are white and have long antennae. These are yet to be studied properly. The caves are also home to three bat species: the Long Winged Bat, Dobson's Long Tongued Fruit Bat and the Kashmir Cave Bat. "The number of bats has reduced significantly, which is alarming because they control pests. Their current population is between 3,000 and 5,000," says Adora Thabah, an expert on bats. "There are fish which have been living in these caves since ages and have lost their pigmentation. Coal mining activities are a severe threat to these life forms," warns Thabah. "Unscientific mining of coal is a hazard to the existence of these caves and their fragile ecosystems. Already all the rivers in Jaintia Hills are polluted and highly acidic due to mining," adds Kharpran. In Jaintia Hills, primitive surface mining method, also called rat-hole mining, is used (see box: Owner's mine). The land is cleared by removing the vegetation and then pits, 5 to 100 sq m in size, are dug to reach the coal seam. The excavated matter is dumped in the surrounding area. A large amount of soil runs off and gets swept inside the caves and coats the stalagmite and calcite formations with mud. In many areas sandy clear underground streams are getting replaced by torrents of mud. Coal seams, 30 cm to 212 cm thick, occur embedded in sedimentary rocks, sandstones and shale of the Eocene age (54-38 million years ago). During mining large amounts of shale are brought to the surface as mine spoil and as by-product of coal cleaning. Iron pyrites in shale decompose when exposed to air and water, and produce sulphuric acid and ferrous hydroxide. These flow into the surface and underground water, making it unsuitable for aquatic life. The Centre for Environmental Science, North East Hills University, has found water bodies surrounding mines to be highly contaminated. Then there is another threat: increased flooding of caves. Mining may be partly responsible for this as water gets accumulated in the excavated pits and seeps into the caves. Higher water levels inside the caves erode sediments. Coincidentally, caves are adjacent to huge reserves of coal and limestone. The Meghalaya Pollution Control Board says it is studying the effects of coal mines on the environment and the caves. "Once the mining policy comes into effect, every coal miner will be required to treat the mine water," says D Hooroo, member secretary of the board. But that is a long wait.